Donkey wake-up day came at the end of February, when with a little help I realised that young, inexperienced Mali was not the donkey for the challenge. I began to Google in earnest, cramming donkey knowledge into my mind, having long phonecalls with dealers and beach runners, joining a forum – complete immersion in equus africanus asinus. I discovered that lots of people thought it was a great idea, but too far, not this year, or not with a donkey, or not with inexperienced me. Out of the process, three people became brilliant, tireless advisors. So here’s a little thank you note – without you I would have ended up… well… I’m not out of the woods yet. But you three have taught me all the little but concentrated donkey knowledge I have, and even better than that, can see the attraction of walking around Wales with a donkey. Tamlin is an animal behaviour specialist with lots of letters after her name. 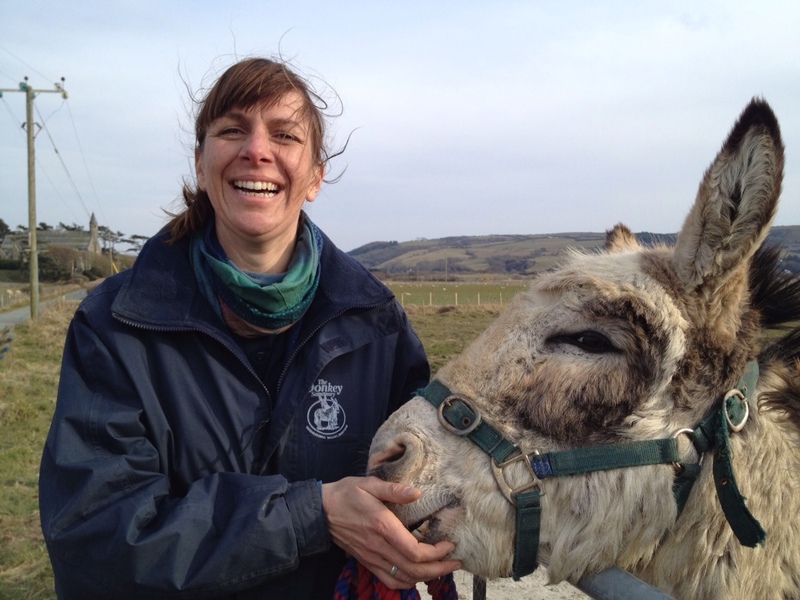 She’s also the Donkey Sanctuary welfare officer for more than half of Wales. She responds to calls when people have seen unhappy donkeys (although sometimes that is just what donkeys look like, she says), and when necessary rescues them, removing them to foster families or to the sanctuary itself. The Donkey Sanctuary – the biggest of its kind in the world – are keen to get people using, exercising or working their donkeys, which are too often just parked as a ‘paddock ornament’, and left to get fat. Through Tamlin’s enthusiasm the Donkey Sanctuary are supporting my walk, which means a lot to me. Tamlin is, it turns out, a new-donkey-handler behaviourist too, she sees instantly if I’ve lost confidence and reassures and calms me before things get nervy. She has taught me how to be quiet, authoritative, and fair with a donkey, how to check its hooves, how to get past obstacles, encourage a ‘planted’ donkey onwards, catch a donkey in a field, when to thank it with neck-rubs and little treats, how to groom it, and how not to get fed up. Obviously I’m no expert, but I’ve already put this training into use when she’s not there, and have had a few little triumphs. Fantastic and wonderful – all you seek is on your childhood doorstep. Most of all Tamlin is just really fond of donkeys, and it’s catching. Which is lucky.